As allegations of sexual assault and harassment mount against Kevin Spacey, they include claims of misconduct during his time as artistic director of the Old Vic between 2004 and 2015. There are allegations of serious misconduct on the Old Vic’s premises and while Spacey was representing the London theatre. None of this is yet proven and Spacey, via his lawyer, contests a number of the claims. However, it raises questions about the Old Vic board during Spacey’s tenure. The Charity Commission has written to it “to seek clarification… and assess if there is a regulatory role for the commission”, stressing that this is not yet an investigation. It should be. The Old Vic claims no complaints were made against Spacey during his time at the theatre. It has set up a ‘confidential’ complaints process. It also says it has brought in external investigators to deal with historic complaints. Were any of the Old Vic’s trustees ever aware – to any degree, even via rumour or anecdote – of actual or alleged improper or illegal conduct by Spacey while he was at the Old Vic, or before he was appointed artistic director? What due diligence was done prior to his appointment? If they were aware, what steps did they take to investigate whether the allegations were true or false? If they were not aware, how was this possible given that rumours are alleged to have been an open secret among some staff and were widespread enough that an artistic director of another London theatre has claimed to be aware of them? 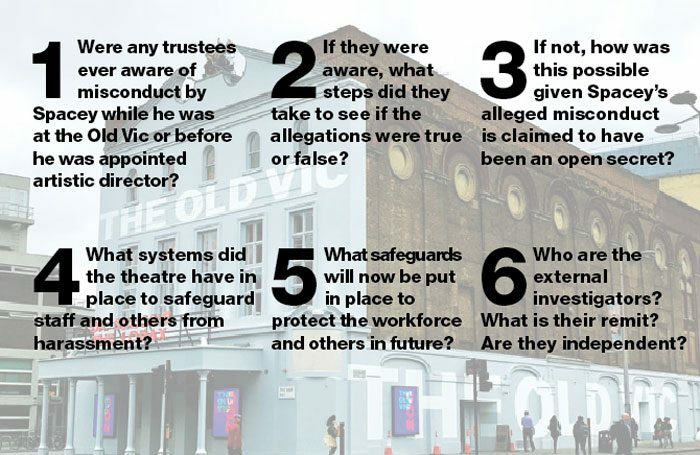 What systems were in place to safeguard staff and others on the premises of the Old Vic from harassment? If these safeguards failed, why and how? What safeguards will now be put in place by the board to protect the workforce and others coming into contact with the theatre in future? Who are the external investigators who have been appointed? What is their precise remit? Are their services being offered to those contacting the confidential complaints line? Are they independent? If not, how can the complaints service be deemed confidential? There are five current trustees who served throughout Kevin Spacey’s tenure: Sally Greene, Robert Bourne, Stephen Daldry, Alan Banes and Joyce Hytner. The building celebrates its 200th anniversary next year. If this historic theatre is to continue as a leading cultural institution, the board members who served during Spacey’s tenure must show they did everything in their power to safeguard staff and all those who interacted with the Old Vic during that period. If they cannot, they need to answer a seventh question: should they resign? We put these six questions to the Old Vic. This is their response in full.